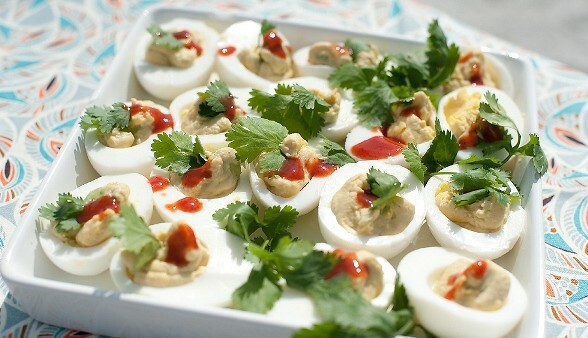 Sriracha and avocado take this deviled egg recipe to a sweet and spicy, modernized flavor profile. Eggs may be prepared up to a day in advance, with or without filling, and stored tightly covered in the refrigerator. Pop yolks from whites, and place in a mixing bowl. Add mayonnaise, lime juice, honey, 1/4 teaspoon smoked sea salt, 1 tablespoon sriracha. Blend well to combine all ingredients. Add filling to a piping bag or plastic bag, and pipe into egg white halves. Garnish just before serving. To garnish, drizzle eggs with several drops sriracha (to taste), then top with a sprinkle of cilantro leaves and if desired, a dash of smoked sea salt. Recipe by Angela Sackett (dancingwithmyfather.net).